I have had a couple of busy weeks working on some personal projects and workshops. Here is one of those I can share with you. These cuties are my very good friend's two daughters. Believe me they are as cute as buttons in real life too. 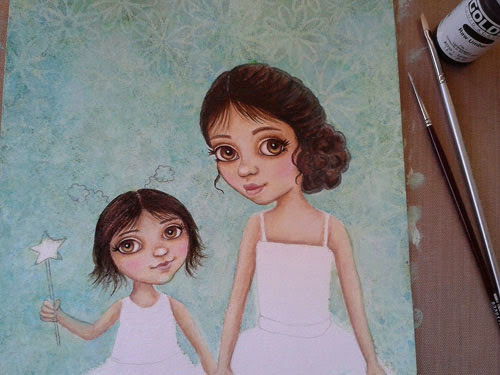 This artwork is for her eldest daughter's birthday. This is a mixed media piece using spray inks and gesso for the background, acrylics and caran d'ache watersoluble crayons for the figures. 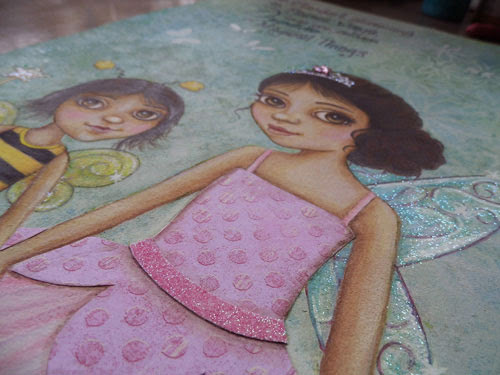 Pink dotted scrapbook paper and glitter paper made the pink fairy dress stand out that little bit more. 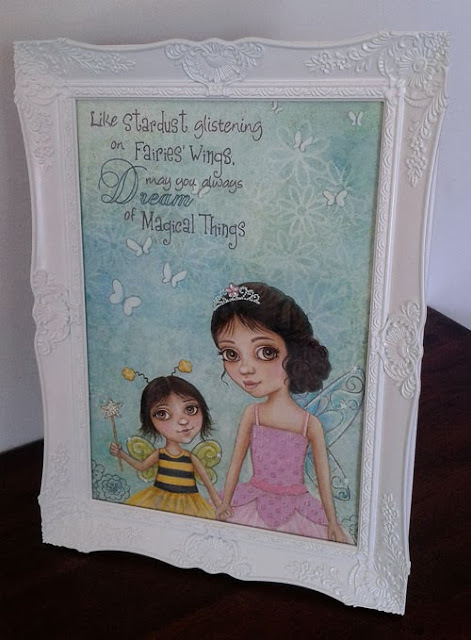 A wave of glitter paint over the wand and and fairies wings, add to the effect. Sparkle glitter glue and a pink embellishment bedazzle the little tiara. An appropriate inspirational quote in glitter gel pens completes it. The finished artwork sparkles and twinkles in the light, it is a pity the camera didn't pick up all that glittery goodness. I did not have a photo of the girls to work from but hopefully I have captured their personalities. 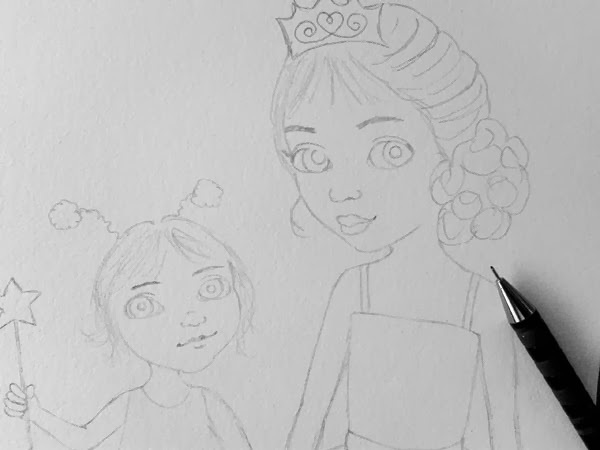 Working on this piece made me think, as adults, we can lose that sense of magic. Children remind us to believe in the impossible and just have fun! 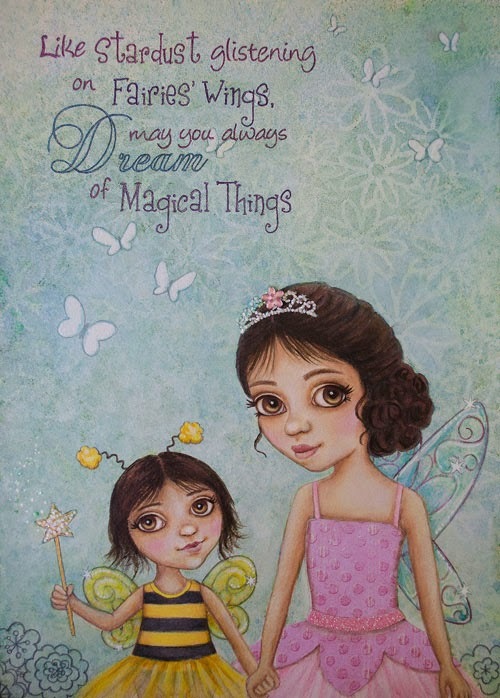 Until next time, happy creating and have a happy glittering weekend! Oh my goodness Serena this is just so precious and beautiful! I am sure she is going to be one very happy little girl. I also want to say that I love your design over at Jane Davenport - the print and scan course looks like it may be one I should seriously consider. Take care and enjoy your weekend. Serena, I just subscribed, your work is so very beautiful! I love your fairies, so precious! Your kind words are very much appreciated Pink Stamper Girl.